Metal-clad cable, abbreviated as MC has become popular for electrical installations because it helps to achieve faster job turns at a lower cost. It is not surprising then to see electrical contractors for both commercial and residential work, use the Spanwell large S hooks every day to hang baskets that dispense MC Cable and Romex wire. 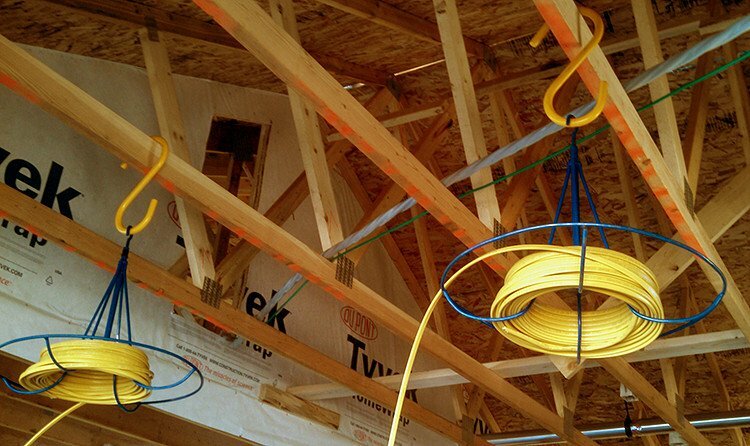 Place the 12″ S Hook for hanging on an overhead truss or joist. Place the top of the wire basket into the bottom opening of the S Hook. 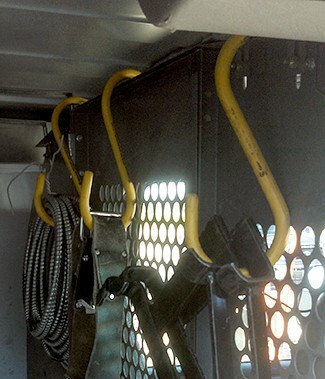 The wire basket holds 250′ of MC Cable or Romex wire. . Pulling wire more easily is the goal of any electrical contractor. However, there are many more benefits for electrical contractors who use Spanwell’s extra-large S hooks. These extra-large S hooks are coated with a heavy PVC coating and will not mar other surfaces. Their solid aluminum core increases safety in hot and cold temperatures. They are non-conductive and extremely durable. Spanwell S Hooks, 12″ SW1275 used in this application can be purchased individually or by the box of 25. See all three sizes of extra-large S hooks here.